Monday night I was dreaming. Then I was woken up by a lion fish swimming through my bedroom. I didn't want to get finned and have to go to the hospital, so I hit it with a pillow. Definitely need to get better sleep. At least I got all my steps today. Today's block - Flock of Geese - is wonderfully simple. 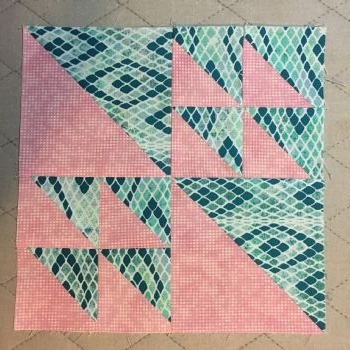 All half square triangles, and I love the pink fabric. Wish I'd bought more of it.